One of the places in the Wellington region that I’ve never properly visited, which I’m almost embarrassed to admit, is the area around Pencarrow Head within East Harbour Regional Park. Though it used to be remote, it’s now very accessible from Wellington, just down the road from Eastbourne on the eastern side of Wellington Harbour. It’s still very unpopulated though, despite the accessibility. 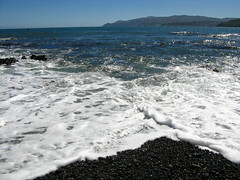 I arrived back in New Zealand from the USA at 8am Tuesday morning and it was an awesome day for blue sky and sunshine. As I’d already decided not to go to work, I thought I might try and go out for a walk instead rather than just sit around at home and try to sleep off any possible jet-lag. I’m very glad I did, because I think I needed the recovery time after being trapped in a concrete jungle for so long. I like coming home. I think it’d be possible to catch a bus to Eastbourne and do the entire thing with public transport, but I drove there on this occasion. The legal part of the road ends a few hundred metres south of Point Arthur, at a gate called Burdans Gate. From here it’s necessary to get permission from the Hutt City Council to drive any further, but it makes more sense just to park a car and start walking. Location: East Harbour Regional Park, Wellington. 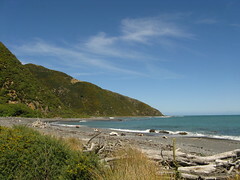 Route: Along the coast to the Pencarrow Lighthouse, around Lake Kohangapiripiri, and back the same way along the coast. 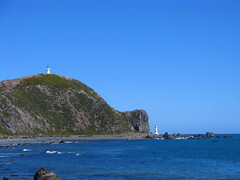 Pencarrow Head is in part known for its 2 lighthouses marking the eastern entrance to Wellington Harbour, only one of which is still operational. Lighthouses have existed in some form since 1841, and their construction and operation forms a significant part of the area’s history. Until now I’d only known them as an interesting light on the far side of the harbour, which would often be annoying when I’m trying to do astronomy things from the beach near Seatoun, so it’s nice to come out to see them up close. 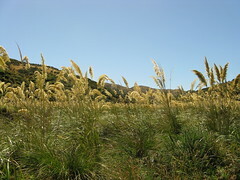 There are also two very nice lakes in the area, known as Lake Kohangapiripiri and Lake Kohangatera. I only reached the former on this particular walk, so I’ll set aside time to check out the latter in the future. The coastline up to Pencarrow Head is also littered with shipwrecks, most of which occurred in the early days before the harbour entrance was well mapped and before navigational instruments were as reliable. 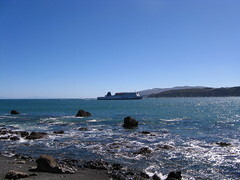 It’s also known, however, as the coastline where many of the survivors and nearly all of the 53 dead washed up when the New Zealand inter-island passenger ferry Wahine struck Barrett Reef and sank in 1968, which although before my own time is an event still strong in the memories of many people who live in Wellington. It’s for this reason that a rock at the car-park contains a memorial plaque that remembers the disaster, complemented by an additional memorial at Palmer Head on the western side of the harbour entrance where many more survivors were rescued. I started walking from the parking area at about 12.45pm, along what is almost entirely a flat, coastal un-sealed road. The whole area is very well signposted. From the parking area, the signposted time to the Pencarrow Head lighthouses is around 3.5 hours return, or probably 1 hour 40 minutes to get there if you allow some time to actually stop for a moment. I found that it’s very do-able in about an hour, although this is at a relatively brisk walk with occasional stops to look at things. The coastal road continues all the way around to the newer (1906) Pencarrow Head lighthouse, which is built on the beach once it was realised that fog issues often made it difficult to see the original lighthouse at a higher altitude. Shortly before this, though, a track separates and climbs the side of the ridge up to the old lighthouse. It’s a reasonably steep climb, but it doesn’t last for long. The old lighthouse still looks to be in remarkably good condition for something that’s no longer in use. All along this short section, signs have been put in place with interesting historical notes about the history of the area, the lighthouses and the people who operated it, and the way they had to live early on when the area was far more remote than it is now. Climbing to the old lighthouse. 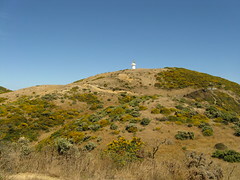 From near the old lighthouse, a short track leads to the lookout area on the top of Bluff Point. It’s a dead-end track, but the view’s very nice on a clear day, which was certainly today. Looking to the south-east towards Baring Head further around the coast, the Baring Head lighthouse was clearly visible about 5 kilometres away. After 2pm there was still lots of time left in the day, so rather than walk straight back, I decided to follow another signposted track down to Lake Kohangapiripiri, which I reached at abou 2.20pm. 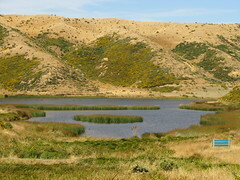 Along with the neighbouring Lake Kohangatera, this lake has a reputation as one of the few remaining undisturbed wet-lands left in New Zealand. It’s clear why this is the case when approaching the lake, and the bird life present is impressive. I think I could quite easily sit here for a long time and just watch the birds. 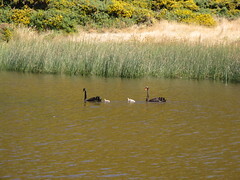 There are swans everywhere, swimming around with baby swans following, and what might be an Australian Coot or an Scaup, but I don’t know my birds well enough to be sure either way. 20 minutes after having started on the Lake Kohangapiripiri Track, I reached a small valley fenced off to one side, but there’s a pink marker tied to a tree, and an ad-hoc track through the grass and a gap in the fence. It’s not clear if this is a marker for a track, or possibly it’s a way up to a ridge along to Mt Cameron to the north, but I didn’t find out on this trip. Cicadas are deafening by now, and simply walking around the lake is triggering another 10 or 15 cicadas to leap into the air and flutter away every few seconds, although one is stuck fluttering in a spider’s web. Every couple of minutes I walk within 15 metres of another bird hidden in the reeds, and it noisily flutters into the air to circle high above. They’re very cautious about letting people get close. I think next time I visit, I’ll bring a bird identification handbook, because there’s so much variety and it’d be a good place for learning. A couple of hundred metres from the mystery tree marker, a boardwalk leads straight through the swamp, with nearby signs warning that the water may be deep and is a drowning hazard. This swamp is the wetland that leads up Cameron Creek, and once the track climbs above it to the ridge on the south, it looks impressive from above. The day is bright and sunny, and I can’t help thinking that I’d love to come back during a time when the weather is more overcast and raining. It’d be a completely different atmosphere once again. 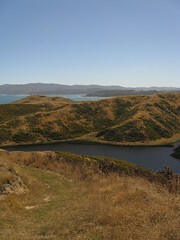 Looking over Lake Kahangapiripiri towards Wellington Harbour. At 3pm I arrive at what I think is about spot-height 108 to the east of the Pencarrow Lighthouse, and I can confirm this with a quick compass bearing. 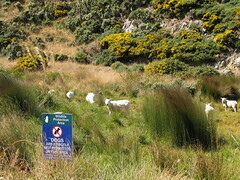 There are lots of signs around here pointing to various routes towards the Lake Kohangatera Lookout (over the second lake), down to Lake Kohangatera, and to the Gollans Stream Wetland, which is the swampy area that drains into the second lake from the north. Unfortunately I don’t really have time to go that way this time, so I just follow the Lake Kohangapiripiri Track back down to the coast. Being back at the lake level again 10 minutes later is a great feeling and the colours today are expressively discrete. From here it’s a short distance to the coast road, and after a few minutes it’s possible to walk back to the lake-edge and finish circumnavigating it completely. The wet-land birds here are very cautious of people, and still won’t let me get close, but there are many of them. One small irony, visible just before I head back up over the saddle past the lighthouse and back to the coast, is the Wildlife Protection Area sign placed in front of the lake. Directly behind it, at least 7 sheep are grazing. This isn’t a new thing, as to my understanding the area has been grazed historically as part of the Pencarrow Station right back to the time when it helped to sustain the lighthouse keepers. It still seems quite amusing, though. Back on the saddle near the old lighthouse at 3.40pm, all that remains is to return to the parking area along the coastal road. The sunshine and the glittering colours on the harbour from here are just magnificent. As the Interislander Ferry enters the harbour, it’s a reminder of just how close ships have to be to the shore, and in the back of my mind it’s a reminder of exactly how narrow this channel into the harbour actually is. After an hour of walking, I reach where I parked the car at Burdan’s Gate at about 4.45pm, regrettably having collected a few pieces of rubbish along the way. What a rewarding day! This entry was posted in daywalk and tagged daywalk, east harbour regional park, independent trip, wellington. Bookmark the permalink.